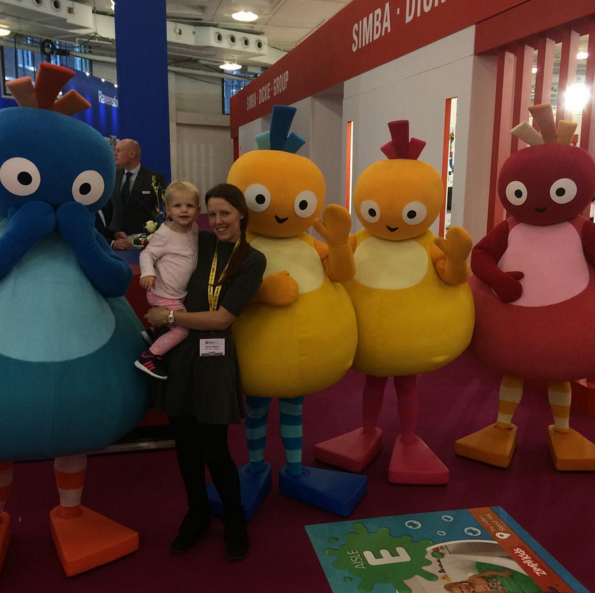 Yesterday was an exciting day for both me and Lily as we were attending the Toy Fair that is held at Kensington Olympia. Both me and Lily are big toy fans. Of corse Lily loving lots of toys because she is 2 years old, and me just simply being a big kid at 30! I didn't know what to expect from the toy fair but when we got there the place was filled with so many stalls filled with toys. There was so much to see. We didn't actually manage to get around all the stalls but did get to see a lot. For me the day was filled with many meetings. Some with brands you see me working with on the blog on a regular occasion and some new. 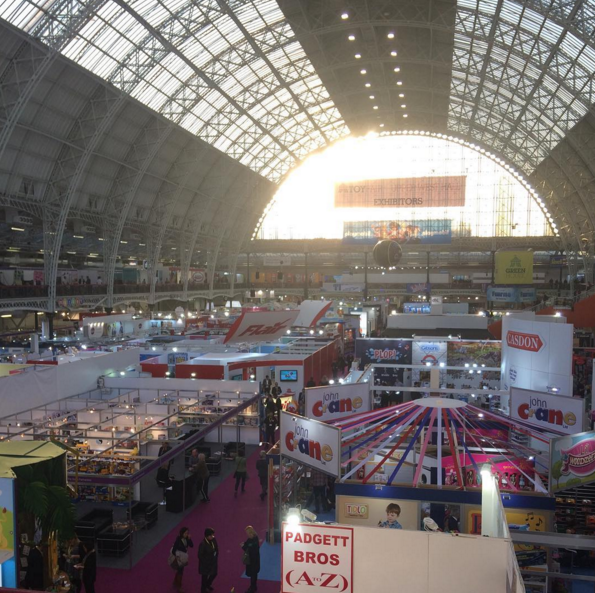 A few brands that I was excited to be meeting was Orchard Toys and Learning Resources and Ravensburger who you may have seen me work with on the blog. They have some great new toys that we got to see and try out. But i'm not going to spoil the surprise. Hopefully you shall be seeing me write about a few of those in the coming months. We visited lots of more stalls and Lily really enjoyed playing and testing out some of the new toys. It was really nice seeing the brands really enjoying watching Lily enjoy their toys. 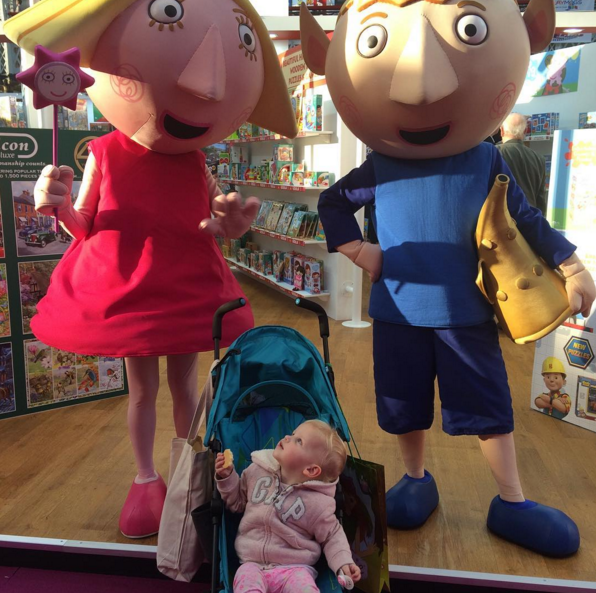 Lily really enjoyed the toys at the Tomy stall. She was screaming loudly in excitement and giggling away at all the new toys and what they did. It was so lovely to see! 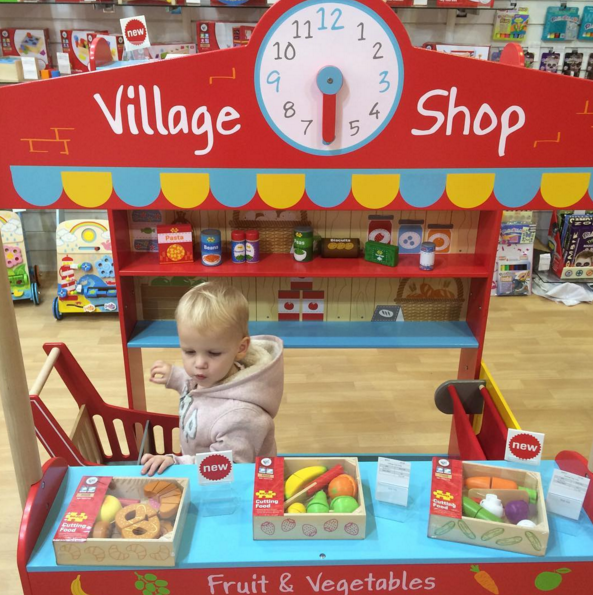 We also popped to the Big Jigs stall and Lily enjoyed playing shopper in their village shop toy. While we were there I just had to go and visit Lottie. One thing you may not know about me is that I collect dolls. I have always loved Lottie dolls but only ever seen there photographs so it was so nice to see them in real life. This is something I think I was a little more excited about than Lily. Told you i'm a big kid! If you don't know Lottie Dolls then keep a eye out on the blog as I may have an exciting post about them coming up soon. We then headed past Sylvanian Families. Ive always been a big fan of them and now Lily is getting older she has started taking an interest to. I got Lily a Freya Rabbit when she was around 18 months old and she now loves her and knows exactly who she is. She loved this bigger Freya that we found stood on the stall and Lily just had to give her a cuddle. 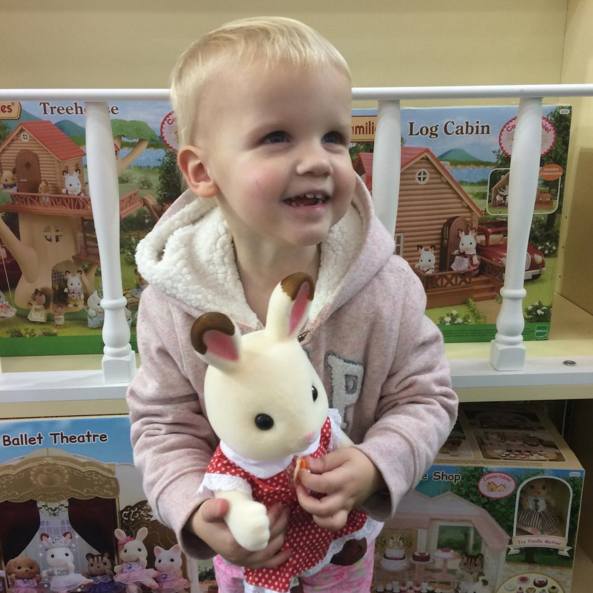 I can't wait for Lily to have more Sylvanian families to go with her Freya. One company I was really impressed with was The Irish Fairy Door company. It was great to see a range of things they did as one thing I didn't know about them is that they do more than just doors. Also the detail on the doors is so beautifully done. They really are special. At the stall, Lily made friends with a fairy who was working on their from the Irish Fairy Door company and they became best friends. She introduced her to the other fairy's which Lily gave really big hugs to. The stall was lovely to visit and the experience was made really magical for Lily. The last thing I have to mention about the Toy Fair is the big characters that were walking around. This made Lily's day as she got to meet some of her favourites. 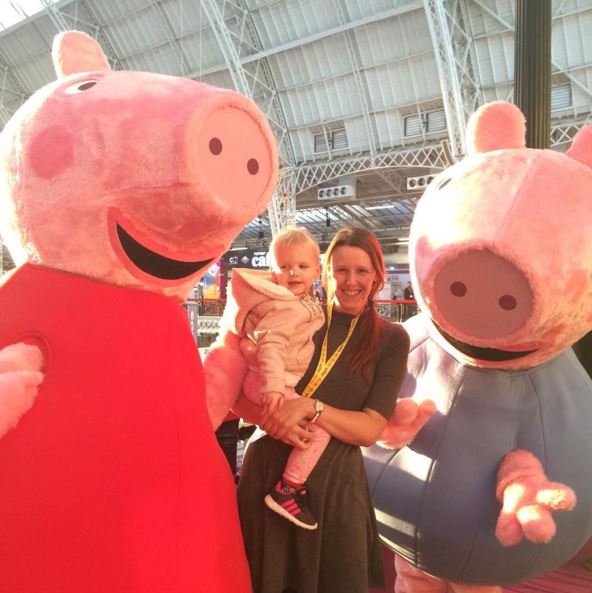 She met Ben and Holly, The Twirlywoos, Upsy Daisy, and her favourites Peppa Pig and George. She was so excited and gave Peppa a big hug! 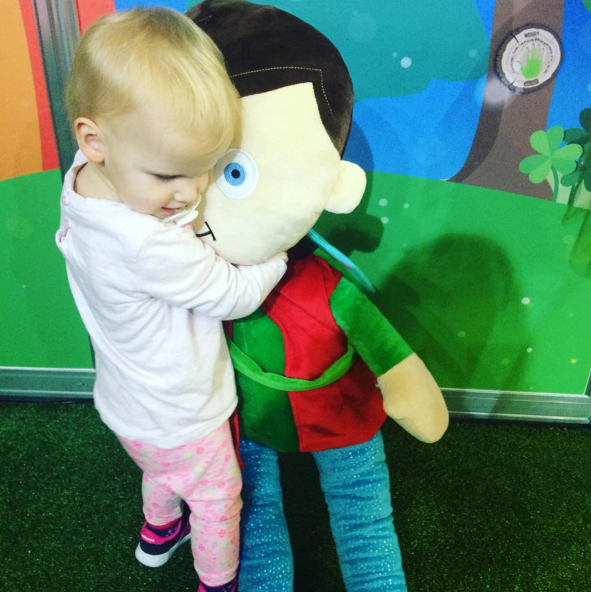 We met so many great toy brands at the Toy Fair and we had a great day. I Look forward to blogging about some of the great toys we saw there soon. it looks like it was worth the visit and a fun day was had ! The Toy Fair looks Wonderful. I'd love the Opportunity to visit sometime. Lovely to see Lily so happy, she seems delighted with the toys etc. A memorable day for you both. This looks like fun! My little boy would go mad for the twirly woos! Hopefully Toy Fairs will be held in many parts of the UK. As it seems they would likely be very successful. Oh my, I would be in my element here! My daughter is 14 months old but come next year I bet she would love it. We have about £600 worth of sylvanian families toys stored away in our garage from our other girls. I can't wait until she's old enough to play with them. I can't wait to see what toys you have to blog about. This looks like so much fun - my children would love it!